There are so many companies these days jumping on the subscription box and post box products and while some are absolutely awesome, some fall flat. See it takes more than just shoving products inside a letterbox friendly box and hoping for the best. The best subscriptions come from brands who are creative, think out of the box and offer us, the consumer, something different. See I don't know about you but I tend to throw my money at things I could never think of or buy or do myself. Well, Cheese Posties is one of those things. Inside each box you get bread (obviously), and the ingredients needed to re-create the recipe on the card. I love how they've styled the recipe cards like Top Trumps cards. The recipe I received was the Smokehouse recipe which suits me just fine because I LOVE barbeque. 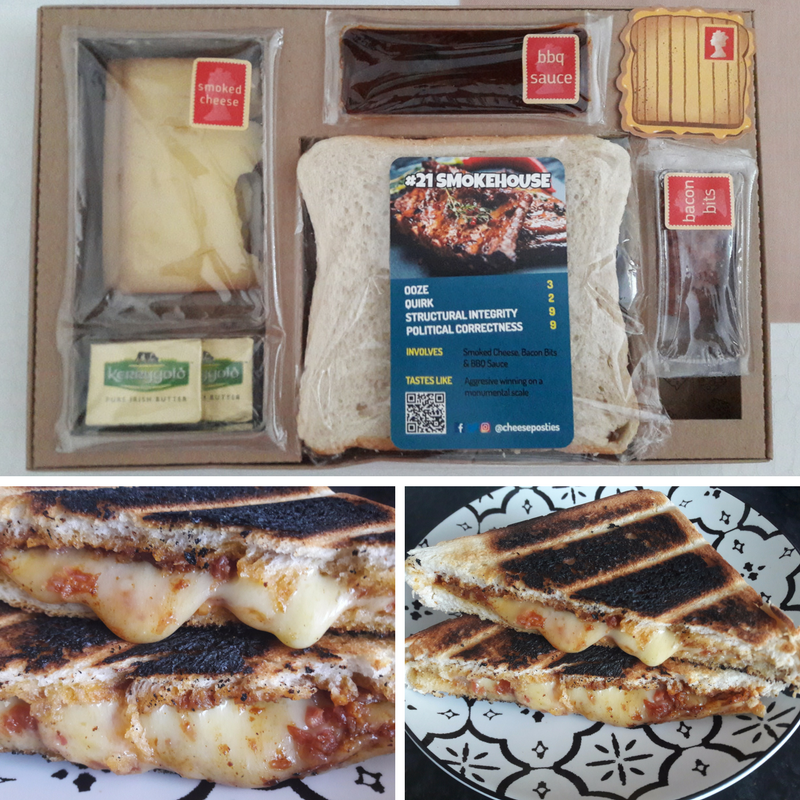 Inside the box was Kerrygold butter (real butter), barbeque sauce, smoked cheese, white bread and bacon bits. And not just fake bacon bits - I mean these were genuine bacon bits, I take my bacon very seriously, can you tell? Now, I like my toast well done - as you can see from the image, but you can choose to have your toast lighter. Or, you can grill it, toastie machine it or fry it. You can really choose your own cooking method. I took one half up to Connor who normally isn't a toast fan or a barbeque fan and he loved it! (see I secretly know him better than he knows himself). The savoury cheese with the salty bacon coupled with the oozing barbeque sauce was absolutely perfect and, left me craving way more Cheese Posties. * The Canadian | Cheddar, bacon bits and maple syrup. * Apple Pie | Red Leicester, apple sauce and cinnamon. * Blueberry Smoothie | Cream cheese, blueberry jam and mint. * S'Mores | Mascarpone, chocolate and marshmallows. * The Number 25 | Monterey Jack, teriyaki sauce and wasabi. Do any of them stand out to you? I bet your mouth is watering or, you maybe on the other side of the fence feeling utterly horrified at the sweet and cheesy options but I'll just say two things - chocolate croissants and cheesecake. You can check out the company and what they offer on the Cheese Posties website.